I have always been drawn towards pure, rather than applied, mathematics. 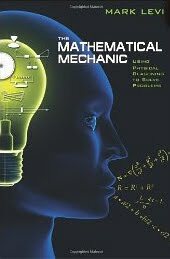 As a student I had no feel for mechanics: I could solve the equations but I had no physical intuition. I always felt out of my depth in any kind of applied mathematics, whereas I felt at home with abstract pure mathematics. Now when I teach mathematics I have sometimes regretted my preference. I see the value of physical applications; I enjoy reading about relativity and quantum theory, and feel that I have gained some understandings of these topics to which, thirty years ago, I couldn't relate at all. 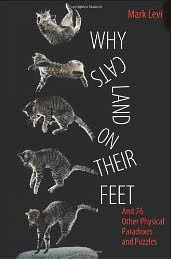 Now I have been looking at Mark Levi's two marvellous books, The Mathematical Mechanic and Why Cats Land on Their Feet. These are books about mechanics. The former uses physics to "prove" pure mathematical propositions, for example using an argument about a rotating fishtank to "prove" Pythagoras's Theorem. (The inverted commas reflect my pure mathematical reluctance to accept that physics can be used in this way!) The latter presents physical paradoxes and their resolution - for example, if, sitting in a seat attached rigidly to the frame of a spacecraft which is stationary in outer space, I push a balloon away from me, what happens to the spaceship? These books are wonderful. Despite my comment about physics and proof above, I find the contents beautiful and astonishing. But they are also over my head. I have to read carefully and think deeply to get the point, and I need to be told why the paradoxes in the second volume are paradoxical because my physical understanding is so limited I don't "get" it easily. So what these books confirm is that I have very little intuition about the physics of the world around us. Had I had a different upbringing that might not have been the case, but I have to accept that my mathematical talents do not extend at all to mechanics. I don't particularly regret that - the pleasure of pure mathematics compensates - except when I realise that my appreciation of Levi's books is so limited. I feel as I imagine someone would respond to Matisse who knew the paintings only from monochrome reproduction - there is much to enjoy but I will never be able fully to appreciate them. This helps me understand why I enjoy quantum theory. I can't do mechanics because I have no physical intuition - but quantum theory makes a nonsense of our intuitions so my weakness isn't a problem! Can I finish by encouraging any reader to seek out Levi's books, if you don't already know them. If you're an applied mathematician you'll love them; pure mathematicians will also find things to wonder at. Even if I can't fully appreciate them, I can still admire and enjoy.